Discover the art of creative thinking and learn how to generate, evaluate and select creative ideas and solutions, quickly and easily. This session focuses on the art and science of creative thinking. You will discover the process of creativity and how your brain has ideas plus participate in a series of fun and challenging thinking tasks which will open your mind to new possibilities! During this session, you will participate in practical brainstorming sessions to generate, evaluate and select new ideas and solutions using 3 of the world’s best creative thinking tools. You can work on creative briefs of your own choosing or select from sample creative briefs. This session focuses on how you will apply your creative thinking skills in the workplace. You will develop your personal action plan and also consider how to continue developing your skills in the future. The session received rave reviews from all participants – even those that were skeptical about soft skill classes. Jayne is a superb presenter and engaged everyone. This class has changed how we approach opportunities and issues within our organization. Once again many thanks for a great day yesterday, I really appreciate all your hard work and support in making it a memorable experience for us all. The Team will certainly be on a high going into the weekend! 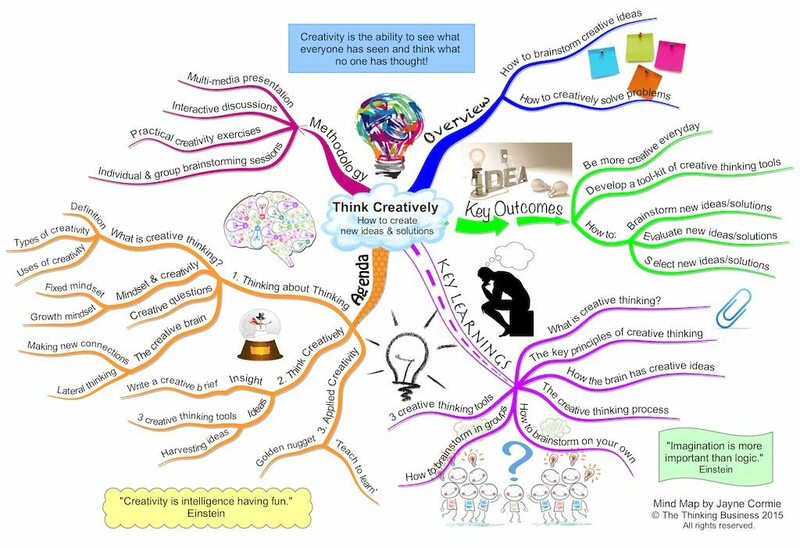 What a great success the Innovative and Creative Thinking course was. We all had a fantastic time. Lots of positive comments about the practical aspects of the day and the opportunity to think differently. 3 hour workshop – focuses on the ‘Your Creative Brain’ session. Alternatively, you can select one thinking tool to learn and practice. Due to the practical nature of the content, customisation is not necessary. During the day, delegates learn and apply the creative thinking tools to creative briefs of their own choice, thus making the day highly practical and relevant. Jayne has spent many years working in the creative field and is an expert in creativity and innovation. Anyone who wants to learn how to think differently everyday using a tool-kit of practical creative thinking techniques.